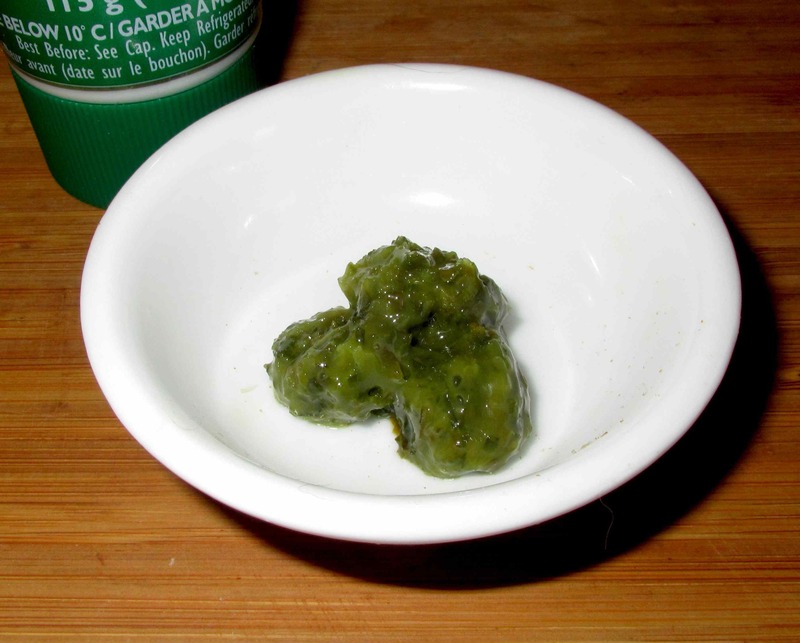 The paste, as you can see, has a very vibrant emerald green color and you can make out actual flecks of the herb. The tube touts itself as offering ‘Fresh, natural taste’ and, indeed, that is what you get. It may surprise you to learn that the very tube pictured above was actually opened a little over a year ago. I bought three or four of them at the same time and this one, after opening, got tucked away in the back of my fridge and forgotten. When I discovered it a few days ago, I was rather expecting to have to throw it away but, to my pleased amazement, it tasted just as fresh and sprightly as when it was first opened. One of the aspects of making a paste from fresh basil leaves is that it can sometimes have a slightly harsh, almost bitter, aftertaste. In this product, though, that particular quality is noticeably absent. There is, however, a bit of a trade off in that, like the Lemongrass product, the added dextrose gives it an artificially sweet note that is a little out of place. Still, while this is definitely apparent when you taste the paste right out of the tube, I have not found it to be noticeable when used in more complex preparations. Certainly, I would prefer to use fresh Basil wherever possible but it is not always easy to find and I often end up buying a bunch to use for one recipe or another, only to end up having what I don’t immediately use wilt and discolor before I can use employ it elsewhere. Accordingly, if I need to put together a quick pesto to use as, say, a rub for roast chicken pieces, it is extremely convenient to have a tube of this stuff on hand. how long does it keep in the fridge once opened ? I have tried their garlic and basil varieties. Once. Once only. They were pretty insipid. Never again for me. They were an outrageous price too, from memory of a couple of years ago. I have always wondered about this product. Thanks for the great review, John! Although I must admit that it kind of scares me what they must do to the basil to make it last like that. They make a dill version that is pretty good- fresh dill goes bad fairly quickly so its handy to have in the frig to go along with fish and seafood. After I saw your first post, I started noticing this stuff everywhere. My thumbs up are the basil, dill, oregano, and cilantro. I tried the other varieties (I’ve seen 10 so far) but the four I mentioned are the best. the dill goes very well in cold cucumber soup. Do you have any experience with the cilantro variations in a tube? Cilantro is my arctic kitchen nemesis; so many of my favourite soups call for it. I buy cilantro chutney sometimes at Indian stores, and it’s OK but adds a vinegar taste which isn’t alway appropriate, and some jars taste better than others (doesn’t seem to be brand-specific, although I don’t buy it often enough to be sure). For my most recent trip north I actually dried some fresh cilantro in my own food dehydrator, which worked way better than I thought it would. Cilantro is notorious for not drying well, but I found the flavour to be better than the most recent bottle of cilantro chutney I had purchased. Forgot to mention, did you know lemon grass keeps well in the freezer? It’s reasonably robust, as well, so if you got it the day before your flight north I am sure it would make it home with you, and then last in your freezer until your next trip south. I used to live out in the sticks where I couldn’t get lemon grass, so I would try to keep some in the freezer. To me it tastes pretty close to fresh when used after freezing. I’m glad to see your review! I’ve seen basil in tubes at the grocery store many times and have wondered if it’s worth the money. I have an outdoor basil plant right now, but this will be great for winter! 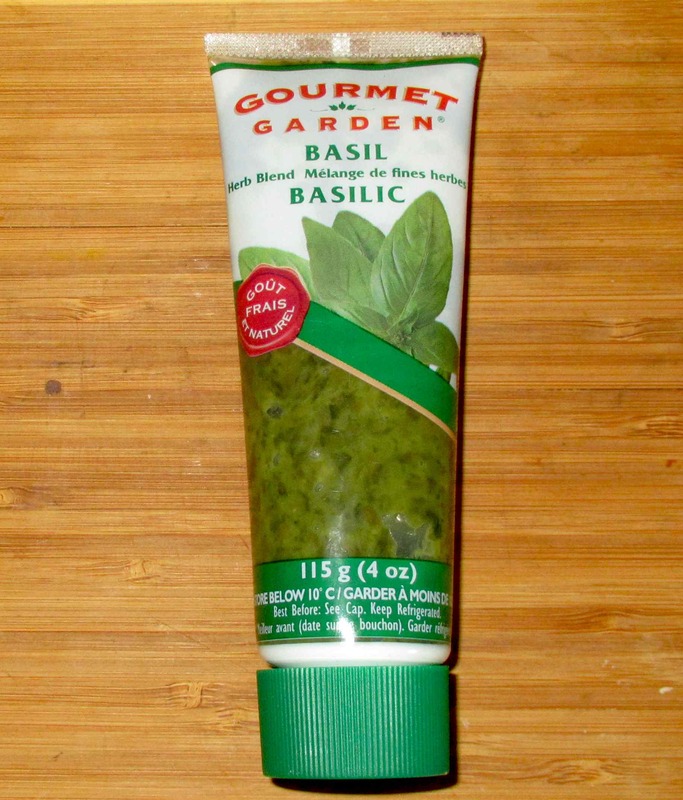 CAN ANYONE TELL ME THE RATIO TO USE WHEN SUBSTITUTING THE BASIL IN A TUBE FOR THE FRESH CHOPPED BASIL. ie: 2 TB FRESH CHOPPED BASIL = APPROX. HOW MANY tsp OR TB. I’m afraid there is no hard and fast rule here as different commercial products have different strengths and a Tbsp of chopped fresh basil would yield different amounts pureed depending on how finely it was chopped to begin with…. The best ‘rule of thumb’ I can suggest is to use about half as much tube-paste as the amount of ‘finely’ chopped fresh basil….Again, that’s only a rough guideline.